With the influx of talent headed West, there are only a few near-locks to make the postseason. We take a closer look at a playoff picture that is now as muddled as ever. The NBA’s balance of power shifted further west this off-season, with a slew of stars bolting away from the Eastern Conference. Save for Gordon Hayward taking his talents to Boston, a number of the league’s premier players headed west, escaping LeBron James’s ironclad grip on the East. Both Paul George and Jimmy Butler found new teams via trade, while Paul Millsap bolted from Atlanta to Mile High in free agency. The recent influx of talent has left the West’s playoff picture as muddled as ever. There are four teams who look to be near-locks for postseason play next year (Golden State, San Antonio, Houston and Oklahoma City), and three who are all-but-guaranteed to spend the playoffs at home (Phoenix, Sacramento, and the Lakers). But that still leaves us with eight teams battling for four precious playoff spots. To sort out the jumbled Western Conference, we decided to place the remaining teams into three groups. Those with the inside track on playoff positioning, those on the bubble, and those who, as presently constructed, are on the outside looking in. So without further ado, here’s who will slide their way into the playoffs next season, and who will be left out in the cold. Clippers: The Clippers didn’t dive into a rebuild after Chris Paul engineered his trade to Houston in July. 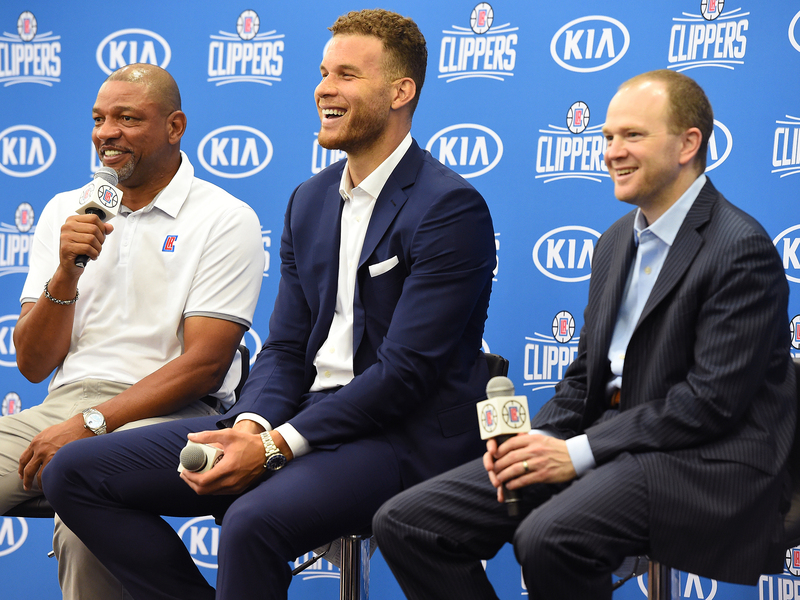 Instead, team consultant Jerry West and head coach Doc Rivers opted to reload, re-singing Blake Griffin and adding Danilo Gallinari in free agency. Throw in the acquisitions of Patrick Beverley and Lou Williams via the CP3 trade—along with the signing of Serbian point guard Milos Teodosic—and the Clips roster now looks as deep as ever. Paul was the engine behind Los Angeles’s rise over the past six years, providing the city with a masterclass in point guard play unseen since the days of Magic Johnson. Griffin and DeAndre Jordan feasted on runs to the rim, and Paul’s midrange game was nearly automatic. But after another early exit in the playoffs, it was time for a change in the City of Angels. The Clippers’ offense often got stagnant late in games, and a lack of perimeter depth—along with an aging roster—crushed L.A.’s chances time and again. Both of these problems were addressed this off-season. There are obviously health concerns with these Clippers. Both Gallinari and Griffin aren’t exactly known for their durability. However, a healthy squad could create a dangerous contender in the West. Griffin will get a chance to run the point and unleash his supreme court vision, and the pair of Jordan and Beverley will decimate opposing offenses each night. It may not be Lob City, but the new-look Clippers still look good on their way to a seventh-straight playoff berth. That drought could end this year, though. Minnesota went on a spending spree this summer, trading for Jimmy Butler and signing veterans Jeff Teague and Taj Gibson in free agency. Add that to Minny’s two budding young stars in Karl-Anthony Towns and Andrew Wiggins, and something special is brewing up north. Roundtable: Next NBA Star to Change Teams? This will be a team molded in head coach Tom Thibodeau’s image. They’ll attack the rim and the offensive glass with abandon, and smother teams defensively. Both Butler and Wiggins are lanky, interchangeable wings, and while Towns still struggles with his rotations down low, pairing him with Gibson (and 6’11" Gorgui Dieng) should create an intimidating frontline. Minnesota will struggle with spacing issues—especially early in the year—but a generational talent like Towns alongside an All-Star in Butler will provide enough of a scoring punch. One of Minnesota’s greatest downfalls last season was its inability to score in crunch time. Both Wiggins and Towns sported offensive ratings under 100 in clutch scenarios, per NBA.com, placing them 45th and 48th respectively out of the top 50 usage rates in the league. Butler should cure their late-game woes almost instantly. He shot 45.1% in clutch scenarios in 2016–17, good for sixth in the league. Minnesota’s future was bright before this offseason, with two former No. 1 picks entering the early stages of their primes. Now with the additions of Butler, Teague and Gibson, the Target Center seems well on its way to hosting playoff basketball for the first time in over a decade. Jazz: While Hayward’s departure certainly deflates the potency of Utah’s offensive attack, it won’t wreak havoc on the Jazz’s outlook for 2017–18. Head coach Quin Snyder is a master at getting the most out of his lineups, preaching a motion offense where the ball zips from side to side. The acquisition of Ricky Rubio fits quite well into Snyder’s system, and a full season of Rodney Hood will add some scoring punch as well. 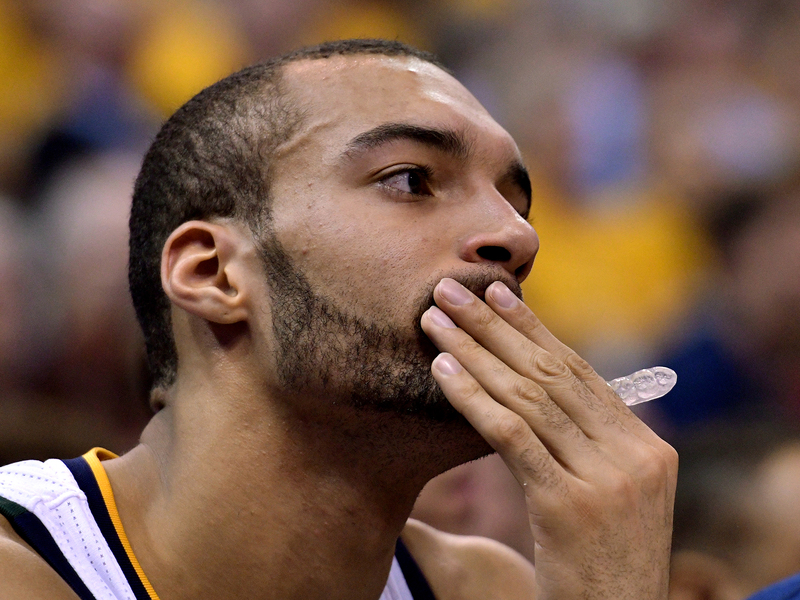 Rudy Gobert should be salivating over all the alley-oops he’ll receive next year. Utah will have to further embrace a slowed-down pace in 2017–18, but that’s just fine for Gobert and Co. The Jazz were last in possessions per 48 minutes last year, and first in team defense. As the rest of the West sprints up and down the floor, Utah will be content as the tortoise to the conference’s hare. Teams around the league know they’ll be in for a 15-round fight each time they head to Salt Lake City. The Jazz won’t crater to the bottom of the conference next year—Snyder is too good of a coach, and this group is too cohesive of a unit. But replacing Hayward’s 22 points per game is no easy task. He evolved into a true lead option, and there is little indication that Utah will be able to cobble together enough production in his absence. A playoff berth is still very much in play, but reaching the 50-win plateau once again is a long shot. Nuggets: A rocky 7–13 start to the season dug Denver a hole it could never quite climb out of last year, and the Nuggets eventually fell one game short of reaching the postseason. But the emergence of center Nikola Jokic and a band of versatile wings gave Nuggets fans one of the most exciting teams in recent memory and a bright outlook for the future. Six Nuggets averaged double figures last season as Denver took advantage of the altitude and sprinted to the seventh quickest pace in the league. Jokic was a wizard passing out of the post, and Gary Harris emerged as one of the league’s budding two guards. And with the addition of Millsap in free agency, Denver now has another reliable post scorer. The biggest question for the Nuggets heading into 2017–18 is at point guard. Jameer Nelson and Emmanuel Mudiay split time at the position last year, with neither putting forth great effect. Nelson showed his age and struggled to stay in front of the West’s crop of speedy point guards, and Mudiay was a turnover machine. More often than not the two served little role other than dumping the ball off to Jokic down low. There’s also the riddle of whether or not Denver can actually stop anyone. The Nuggets ranked 29th in defensive rating last year, much to the frustration of head coach Mike Malone. Too often Denver failed to get back in transition, all but escorting opposing teams down the lane. The Nuggets will win enough games by simply outscoring teams next year, but to ensure themselves a playoff spot, they must devote a greater effort on the defensive end. Blazers: As long as Damian Lillard and CJ McCollum are in Portland, the Blazers will be in playoff contention every year. The duo has emerged as one of the preeminent backcourts in the league, two upper echelon scorers capable of heating up and taking over games at any time. Lillard is one of the league’s best crunch-time scorers, a shot-maker of the highest caliber. That alone is good enough to win on some nights. And don’t forget about Jusef Nurkic. The 22-year-old center emerged as an excellent low-post threat after being shipped from Denver late last year. He averaged 15 points and 10 boards for Portland in 20 contests, exploding for a 28-point, 20-rebound performance against Philadelphia in February. If he continues his development, Portland could finally have the high-caliber center its desperately searched for to compliment Lillard and McCollum. Much like Denver, though, Portland’s season will come down to its effectiveness on the defensive end. For as good as the Blazers’ backcourt duo is offensively, they hemorrhage points on the other side of the floor. There are talented defenders on the roster in Al-Farouq Aminu and Alan Crabbe, but collectively, Portland struggled in 2016–17. Rip City ranked 25th in opponent points per game last year, allowing over 120 points a staggering 18 times. They can’t repeat last year’s mistakes if they want to earn a playoff spot next season. 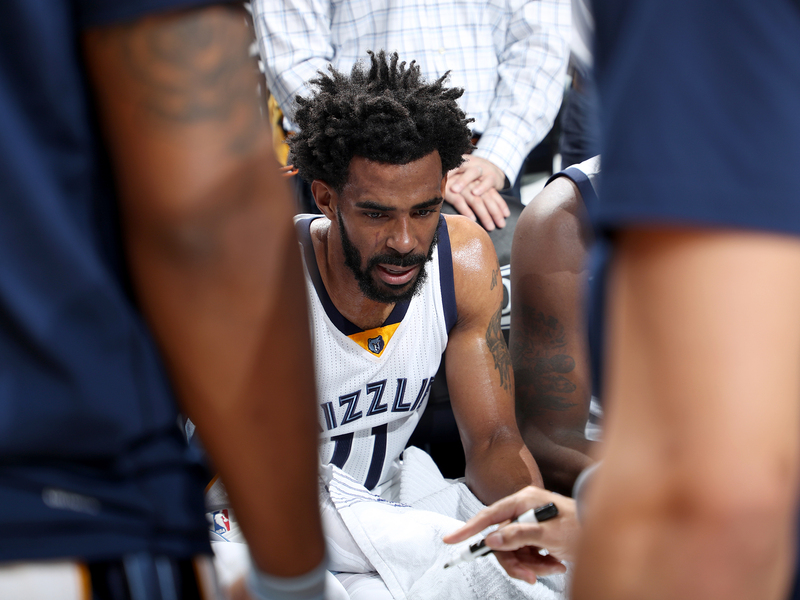 Grizzlies: The Grizz have been a constant postseason presence over the past decade, making the playoffs each of the last seven seasons behind a bevy of Mike Conley floaters and Marc Gasol midrange jumpers. But after a first-round exit to San Antonio in 2016–17 and the departure of three key veterans in the off-season, Grit-N-Grind may soon be on its last legs. Both Zach Randolph and the ageless-wonder Vince Carter signed with Sacramento in the off-season, and the Grizzlies look to have moved on from Tony Allen. They also haven’t yet reached a deal with young swingman and restricted free agent JaMychal Green. Much of the core that vaulted Memphis deep into the playoffs for the last seven years is now gone, with only Gasol and Conley remaining. General manager Chris Wallace has attempted to solidify the rotation behind Memphis’s two franchise cornerstones, adding Tyreke Evans and Ben McLemore in free agency. It would be a surprise, however, if either player vaults Memphis’s standing in the stacked Western Conference. The real boost to the Grizzlies’ roster would be the return of a healthy Chandler Parsons, though after missing 69 games over the past two seasons, it’s doubtful he’ll be worth the $23 million Memphis owes him next year. Conley and Gasol still form one of the league’s premier point guard-center combos, and David Fizdale will drain every ounce of talent he can from the roster. But as the West improves, it may be Memphis who is left with the short end of the postseason stick. Pelicans: New Orleans will be home to the NBA’s most interesting experiment next year, pairing Anthony Davis with DeMarcus Cousins for a full season. As teams throughout the league downsize and embrace the small-ball four, the Pelicans will go the other way, hanging their hopes on two of the league’s most skilled big men. The Twin Towers trial run failed last year, albeit in a small sample size. New Orleans went 7–10 with Cousins, sporting a worse offensive rating with the Kentucky product on the floor. The two players seemed to have little cohesion playing with one another, often resorting to switching off possessions with the ball in their hand. But New Orleans’s struggles in 2016–17 shouldn’t be attributed to Davis and Cousins. The Pellies trotted out one of the worst wing combinations in the league, often relying on the likes of Solomon Hill and E’Twaun Moore for added scoring punch. That just won’t do in today’s NBA. The Pelicans will look to rectify their wing issues by moving Jrue Holiday to shooting guard next year after they signed Rajon Rondo to a one-year deal earlier this week. It’s a worthwhile move, and Holiday has proven he can be at least solid from three-point land. But can Rondo really provide a full season of quality point guard play? That remains to be seen. New Orleans will need 70+ games of good Rondo to sniff the playoffs next year. Otherwise, Cousins may find himself on the move for the second time in two seasons. Mavericks: It’s never a good idea to count out a Rick Carlisle coached team, but as presently constructed, the Mavs roster is too devoid of talent to truly make a playoff push. Harrison Barnes made strides that not many expected of him last year, but he’s not quite the No. 1 scoring option Dallas needs to take the burden off of Dirk as he enters his 20th season. And while the backcourt combo of Seth Curry and Yogi Ferrell provides the Mavs with some prowess from beyond the arc, neither are top-notch distributors or quality defenders. Don’t forget that the Mavs were ready to tank last season following their 2–13 start before turning things around. Dallas’s best hope for a playoff push stems from their rookie point guard Dennis Smith. The NC State product shined in Summer League, drawing comparisons to Lillard and Steve Francis. He’s quick with a smooth crossover, and his jumper is NBA ready. Carlisle is notoriously tough on his point guards—remember the ill-fated partnership with Rondo—but Smith should flourish under his guidance. The postseason is a long shot, but if Smith plays at an All-Star level as a rookie, there could be some magic in Dallas as Dirk winds down his career.